While everyone agreed that dressage movements as well as jumping performances originated from natural moves, many took conscience that the moves presented in the show ring were stylized versions of the natural move and demanded specific training of the horse. Others rather believe that the moves were fully natural going as far as pretending that a horse is fully trained at birth for the movements. One school of thought developed ways to prepare the horse’s physique for the move. The other developed tricks to make the horse do it. There is no doubt that breeding programs improve equine athletic abilities but so far the perfect jumper or perfect dressage horse coming from birth all tacked up with the saddle, the bridle, and imprinted in his chromosomes the most advanced knowledge available is not even conceived in a laboratory test tube. Horses come with great talent but their talent needs to be educated and furthered with advanced understanding of their physique. Behind the curtain of all “natural” approaches, there is a great deal of abuses. Horses are roped down to the ground, let for hours in the stall with rein systems, they are slammed time after time with the rope or a rope halter, they are tortured in the rollkur position, and other abuses including drugs. The natural horse can execute the crude version of natural moves, but as soon as some stylization or enhancement is expected, natural reflexes are ill adapted and trainers increase the pressure. They have to produce results and expect that the horse will figure out what they are incapable of teaching. The elevation of the front legs during piaffe is the outcome of an elastic strain energy stored in the tendons of the lower leg, the catapult mechanism of the biceps brachii and the aponeurosis of the serratus ventralis thoracis muscles. This storage and reuse of elastic strain energy can be effective only if the load on the forelegs is reduced. and the work of the back muscles converting the thrust generated by the hind legs into vertical forces. Truly, the coordination described here for the piaffe is simply the advanced stage of a body coordination that has to be educated from day one. The way a young horse learns basic balance control and forwardness is at a lower level, the coordination, which, refined at a more sophisticated and complex level, orchestrates the horse’s physique for the piaffe. Retired jumper Leo was diagnosed with neurological problems and euthanasia was advised. But soundness was restored by teaching proper coordination of his physique. Once sound, he was able to perform a classical piaffe. The whip never touched his hind or front legs. When trainers have to resort to a bamboo pole and other gimmicks when it come to the piaffe, it is because the horse’s physique has never been properly coordinated for balance and force control. Horses are talented enough to deal with the dysfunction while performing less technical movements. The failure of the training technique becomes apparent when the technical level of the performance is more advanced. Artificial techniques are then needed to mimic gestures that should result from storage and reuse of elastic strain energy in the tendons, aponeurosis and muscles. These gimmicks achieve only a travesty of piaffe. Touching the front limbs with a bamboo pole or a whip alters the dynamics of the foreleg action. It replaces sound use of stored energy by unsound use of intrinsic and extrinsic muscles of the forelegs. Quite often, horses try to cope by shifting the forelegs backward. They look like a mountain goat on a mountain peak. “False practice” proponents try to sell the picture of a mountain goat on a mountain peak as the norm. Whatever the school of thought, classical piaffe has never been a move where the front legs move backward underneath the body, compensating for the incapacity of the hind legs to resist forward displacement of the body over the forelegs. It is possible that due to their poor digestive as well as immune system, the equine species would have gone extinct without its close relationship with humans. Service in exchange for food and care can be ethical as long as the training and the riding techniques focus on developing and coordinating the horse’s physique for the athletic demand of the performance. It becomes a travesty when incompetence and poor equitation does not educate and help the horse. Piaffe is used as an example; when a horse is asked to bend on the circle pulling on the inside rein, this is a travesty as well. Bending the neck does not bend the thoracic vertebrae and the horse is forced on a circle with a physique improperly coordinated for the move. The problem is that if one is pulling on the inside rein, the horse will turn. 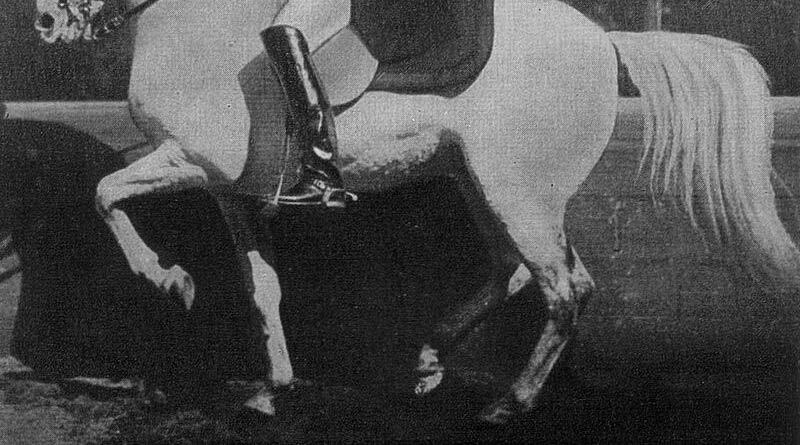 It will execute the move with a dysfunctional body and as long as the rider does not try or does not respect the horse enough to understand how the horse’s physique has to be coordinated to execute the move soundly and at the best of the horse’s talent, the rein effect will be regarded and sold as proper equitation. Étienne Beudant and Mabrouk in piaffe. Xenophon wrote: “For what a horse does under constraint … he does without understanding.” At the time of Xenophon, equine athletes were trained for races and other competitions, with great respect. They were instruments of the owner, driver, or rider’s glory and they were part of the glory. When the gain became money, the power of money eclipsed respect for the horse. Horses are abused for a blue ribbon because the ribbon raises the horse’s price tag and ensures more students for the trainer. Riders don’t even realize that they are abused in the same way than their horse. They are put in the show ring before they can ride, they have to produce more ribbons otherwise they will be rejected like their horse. The system traps riders and horse owners into an artificial world where the value is winning at all cost. Instead, class, ethics, respect, and values that are part of the equestrian art and also part of decent relationship between humans, can lead a horse to success without affecting soundness. Xenophon understood that true performances cannot be extracted from the horse’s physique without advanced participation of the horse’s mental processing. Xenophon was not aware that equines, as well as humans, were constructed of systems within systems within systems, but his teaching is furthered by actual knowledge. Deeper systems are part of the ease and effortlessness that is the class of the performance but these systems cannot be influenced by a rider’s touch, or body movement, or rein effect. The horse needs to understand how to better coordinate his physique for the effort. As the mental education goes deeper, the horse’s central nervous system explores subtler coordination. Central pattern generators, which can learn from each other independently from the brain, further the overall efficiency. It is a fascinating process where the horse further coordinates his physique in search of efficiency and therefore ease. Instead of advancing the experience of our ancestors to actual knowledge of equine physiology, instead of preparing more efficiently the horse’s physique for the athletic demand of the move, instead of engaging and developing the horse intelligence, training systems package old techniques into a new look. They camouflage the whip inside a bamboo pole and the spikes into “The art of touching with the spurs.” The art of touching with the spurs is not aware that in the area touched by the spurs, the horse does have a tactile perception allowing the feeling of touch that cannot be perceived by us humans, even at the tip of our fingers. If one tells you the traditional excuse, “But, properly used,” offer to touch the tip of their finger with a needle, guaranteeing them that you will use the needle properly. I am interested in why the masters held the whip in an upright fashion, and how did this help the horse perform and why it is not seem more today?